When you want to wallpaper a room, the process is fairly easy. The first thing that you need to do is choose the wallpaper that you want. This involves taking a look at the room and deciding which effect is the most desirable. Do you want the room to look larger or smaller? What are the main colors of the furniture and fittings? Do you want a pattern or specific design? The first thing that needs to be done is to prepare the walls. Do the walls have cracks and holes? If so, then these need to be filled in. Then smooth the surface of the wall with a sanding sponge. Once this is done, a good primer should be used to ensure that the surface is smooth enough for wallpapering. Does the wall have old wallpaper on it? If so, you may want to remove it to make the surface smoother and easier to paper over. This is done by spraying it with water and wiping it off. If this does not work, you can buy a commercial stripper that will dissolve the adhesive more easily. Use a wallpaper scraper to make holes and pull off the more difficult bits. Then wipe off the dissolved adhesive with warm water, before washing down the walls again. 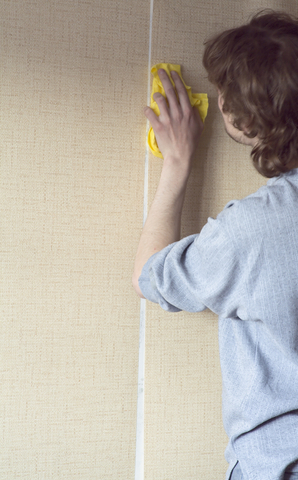 Before you start cutting any rolls of wallpaper, measure the dimensions of the walls that you will be covering. Mark the point on the wall where you will hang the first sheet. For horizontal lines, use pencil and chalk for vertical lines. The next step depends on the type of wallpaper that you have bought. If you are using prepasted wallpaper, all you need to do is wet it in a wallpaper tray (easily found at any hardware store).If, on the other hand, you need to apply adhesive, you are better off putting up a wallpaper table. This is easy to find and relatively inexpensive. The main benefit of a wallpaper table is that it saves a lot of mess and disorganization. You just spread the wallpaper over it and apply adhesive to the back of it with a paint roller. Using the dining room table for this task is a bad idea because you can end up with glue everywhere, which would damage the table. Spreading the paper on the floor is also no good because someone can end up stepping on it or it can get dirty and spoiled. Now you can start spreading the paper on the walls. Tip: Have a bucket of water at the ready to wipe away smears of adhesive as you go. Smooth away any bubbles with a smoothing brush and close the seams between the pieces of wallpaper with a seam roller. Both of these tools can be purchased at any hardware store and using them is crucial for making your wallpapering look smooth and professional. Once this work is done, you can sit back and enjoy your beautiful room, which will look new and exciting.